It is not easy to find what is the best or widely used programming language. Each language and tool has its own advantages and dis-advantages and also related to individual’s/organization’s interest, money, portability, support, dependency, availability etc. 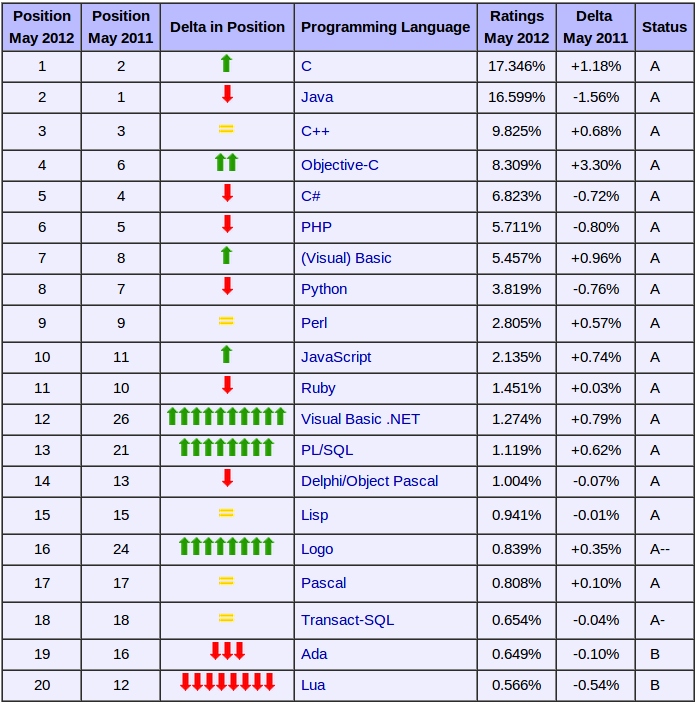 According to the TIOBE Index PL/SQL reached 13 nth position from 21 st position last year. I am happy that PL/SQL is gaining momentum. PL/SQL is a very a powerful language especially for database programming. But PL/SQL can be used also for web application development using Oracle APEX. Oracle APEX ( Oracle Application Express ) is a rapid web application development tool for the Oracle database. Using only a web browser and limited programming experience, you can develop and deploy professional applications that are both fast and secure. Apart from PL/SQL, I personally prefer C, Python and PHP. I would love to learn Objective-C since it is widely used in mobile platform applications. Looking for nice tutorial, link etc. What you prefer to code ? Comment.